By ignoring the advice of Tony La Russa, Jim Edmonds helped the Cardinals manager achieve a milestone. 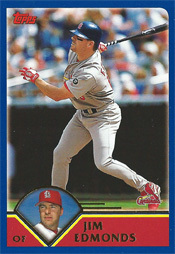 On April 29, 2004, Edmonds hit a walkoff home run in the 13th inning, carrying the Cardinals to a 5-4 victory over the Phillies at St. Louis. _ It gave La Russa his 700th win as Cardinals manager. He joined Sparky Anderson as the only managers to achieve 700 wins with each of two big-league clubs. _ It got the Cardinals to the .500 mark at 11-11 and gave them momentum after having lost four of their previous five games. From there, the Cardinals went 94-46, finishing 105-57 and winning their first National League pennant in 17 years. After the Phillies had tied the score at 4-4 on pinch-hitter Ricky Ledee’s two-run home run off closer Jason Isringhausen in the ninth, right-handed reliever Amaury Telemaco shut out the Cardinals for four innings, striking out five. A frustrated La Russa implored his left-handed batters, including Edmonds, to hit the ball to the opposite field against Telemaco because attempts to pull the ball were resulting in a pile of outs. Edmonds, though, had other ideas. Concerned the Cardinals would continue to strand runners, Edmonds admitted he went to the plate in the 13th inning with the intent of hitting a home run. To accomplish that, he said he believed he needed to pull the ball. “I didn’t want to hit a double and have to start over the next inning,” Edmonds said to Joe Strauss of the St. Louis Post-Dispatch. Telemaco hung an 0-and-2 splitter and Edmonds hit it over the right field wall. The personal satisfaction of reaching 700 wins with a second club became meaningful to La Russa only after he was informed that Sparky Anderson was the only other manager to do so. Anderson, while managing the Tigers, had offered advice to La Russa when he debuted as a big-league manager with the 1979 White Sox. Anderson remained a mentor to La Russa. Anderson had 863 wins with the Reds and 1,331 wins with the Tigers. La Russa had 798 wins with the Athletics. He went on to compile 1,408 wins with the Cardinals before retiring after the 2011 World Series championship season. La Russa and Leo Durocher are the only major-league managers to achieve 500 wins with each of three clubs. Durocher did it with the Dodgers (738), Giants (637) and Cubs (535). In addition to his totals with the Athletics and Cardinals, La Russa had 522 wins with the White Sox.